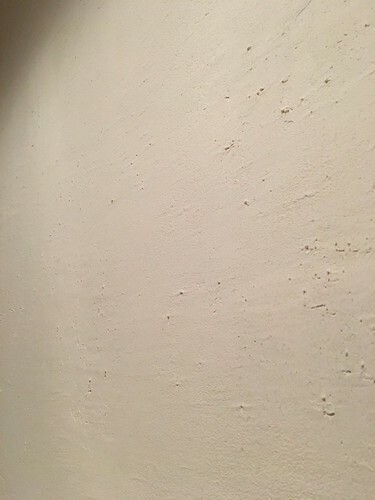 Lime based plaster is sort of the holy grail of plaster restoration, so why is it so hard to find a suitable plaster product? Apparently you just need to know where to look. 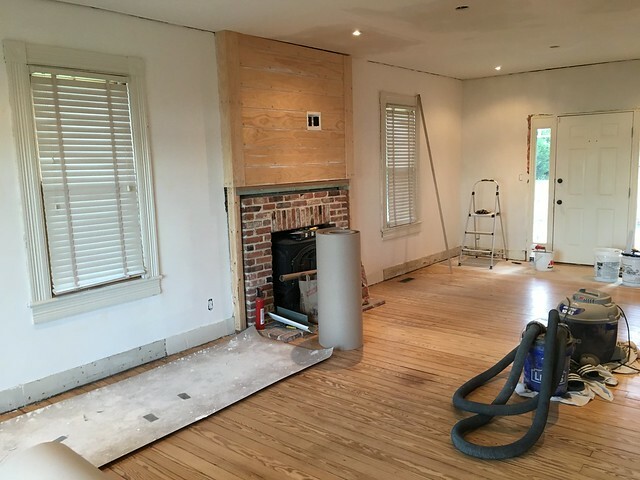 Last week we shared part 1 of our two part post on our plaster repair project. It involved using Structo-Lite as the base coat to even out irregularities around the room. We also embedded fiberglass screen in the plaster to act as an isolation membrane of sorts, which will help prevent future cracks. And we also covered the use of Plaster Weld, which helped us apply the Structo-Lite plaster to new drywall patches. Whew...that was a lot of work to get that first coat on. After the first base coat was wrapped up we turned our focus to the second coat, and that's where the real lime based plaster work started. 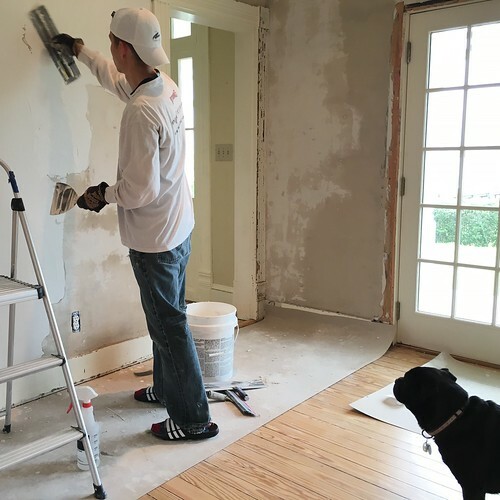 But before I get ahead of myself, let me get you caught up on the experience I already had working with Master of Plaster. 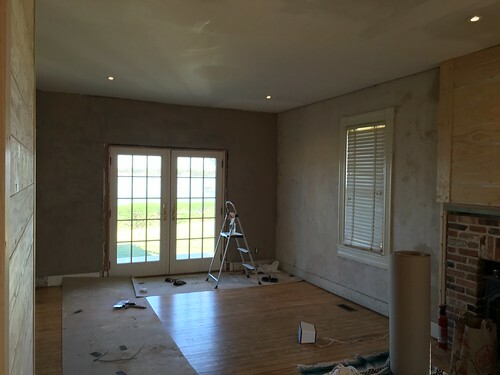 We began working with the proper lime based restoration plaster product just before Wendy's hip surgery in January. The first five gallon bucket on the first wall seemed to go really well, except we had a few areas where the mica in the plaster seemed to be pulling with the trowel, leaving deep gouges and a very irregular surface. Do you see what I'm talking about? I know it might be a little hard to be quite as ridiculously obsessive about the results as I am when looking at a photo, but I felt like it should be smooth, not full of pits. 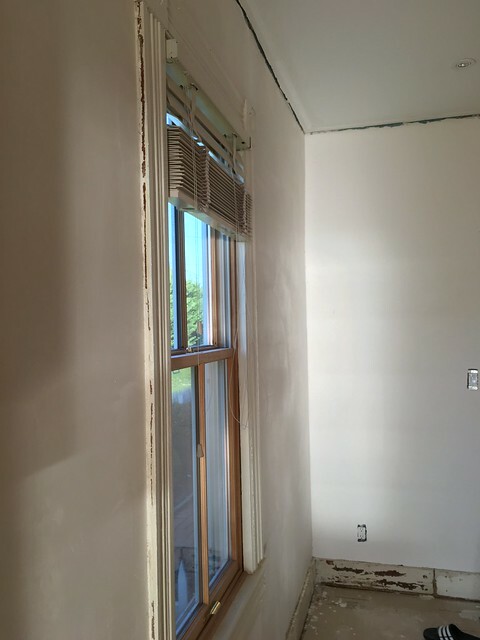 This was our first rodeo with the plaster, and only our base coat, so I wasn't sure if this was correct or not. Knowing the pros at the small, family owned company were there to help, we shared our progress with the experts at Master of Plaster to see if this was normal or not. Their advice was amazingly helpful and they had me on the right track almost immediately. As it turns out my experience with joint compound was undermining my work with this more traditional plaster, and I was making it harder than it should be (which is sometimes the thing I do best). First of all, I was being a little too stingy with the plaster while I was applying it to the walls. I was so worried I'd end up using too much and not have enough to do the whole room that I was using way too little. Couple that with using too hard of an angle on the trowel, trying not to touch it after it was applied (like you do with joint compound), trying to use smoothing tools that are really only meant to overcome joint compound's inherent workability issues, and you have a recipe for an imperfect finish. Keep working the plaster with the trowel and water before it fully sets until we're happy with the results. This advice was spot on. 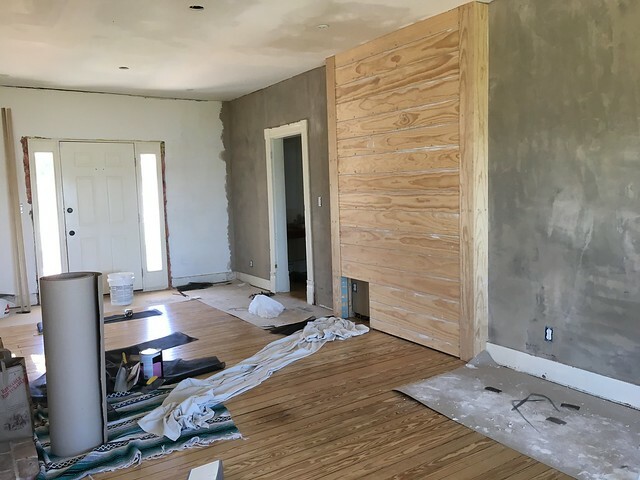 It allowed me to overcome the limitations my familiarity with joint compound had imposed on our project and gave me the necessary confidence to correct any issues I was experiencing. In addition to the sage advice from the pros, I also did a lot of watching of their YouTube demo videos. PRICELESS!!! Armed with the knowledge I certainly needed, I resumed my plastering with renewed gusto! The Master of Plaster, or MoP as it's often called, requires a good mixing before it can be used after it's sat for while. 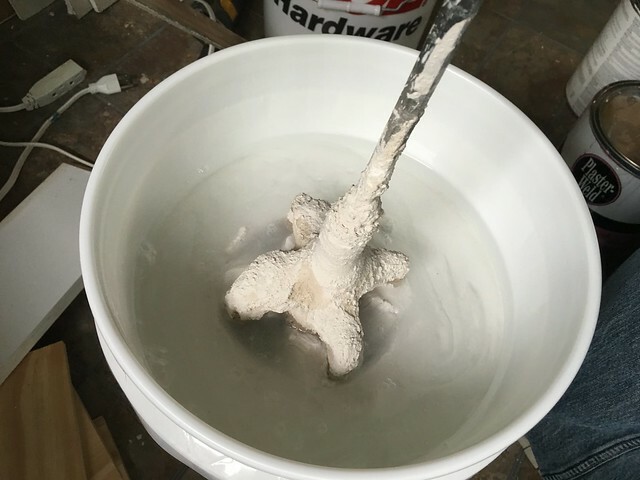 Over my seven 5 gallon buckets of the base coat, I got really good at fully mixing without slopping the material all over the place. The key in the mixing process lies in using the drill mixer attachment to first push down and "cut" the material into four quadrants, then begin mixing from the middle cross section about half way down in the bucket. This keeps it all contained and allows you to work towards the outside and bottom without spraying plaster and water all over the place. Once mixed I was ready to start applying to the wall with my newfound knowledge. 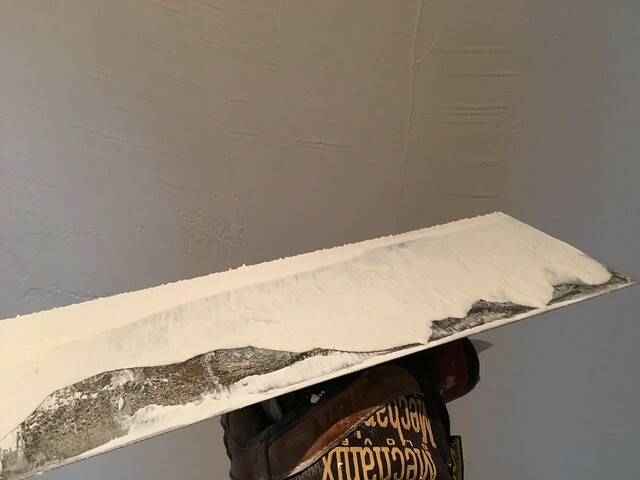 First, I decided to load less up on my trowel, as I kept having an issue with letting globs of the plaster drop off my trowel and onto the floor. My first go-round was starting to look like the Stay Puffed Marshmallow Man had exploded nearby. 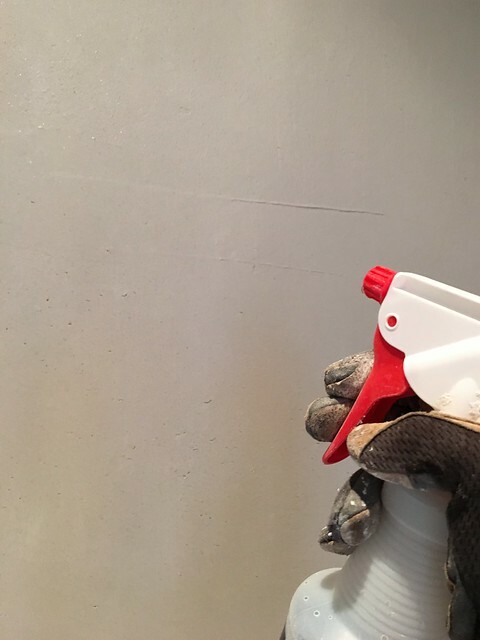 This time, putting less on the trowel, putting that on the wall, then immediately loading the trowel again proved far more effective in getting good coverage without much loss. There's a certain rhythm you have to get into when plastering. Scoop some plaster, place on trowel, trowel onto wall in a single movement, skim over to smooth a few times, repeat. And you can hear from this video, it's not a totally buttery smooth material. The base coat is far more gritty than smooth, and the grit gives you a surface to float on and make a uniform thickness coat of plaster. With this first application speed is the key. Ridges and grooves are okay, but a mostly smooth surface is desired. Corners and around molding takes longer, big open sections go faster. The point where the wall meets the ceiling is the trickiest since the plaster is very wet and wants to jump off of the trowel. Straight from trowel to wall always ends up with a giant plop-thud of the plaster hitting the floor. 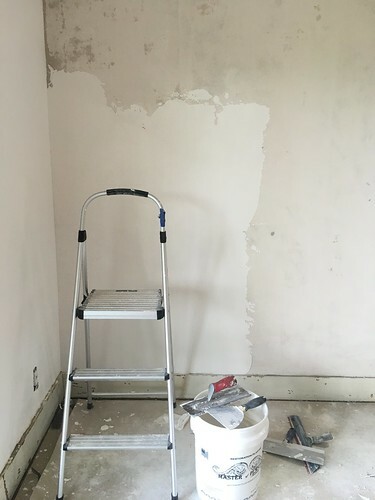 Instead I start by applying a little bit in an upwards motion to pack it onto the trowel, followed by quickly inverting the trowel and applying from top down. Luckily, we're doing crown molding, so the ceiling corners aren't of much concern, but it would be very doable if it was something we'd need to address. As I worked ahead on a large wall section I'd keep an eye on how long it has been since I started the section. The key here is letting the material set up some and then circling back to smooth and take out the irregularities. After about 20 minutes or so I'd get to a stopping point on the wall where I was working and head back to where I started, trowel in hand. This step is the biggest key to working with MoP. After it's started to set up you can work any perfections out with a little water from the spray bottle and a few passes with the trowel. It only takes a few light spritzes and some first pressure with a rather flat trowel and any of the imperfections left from the first application tends to more or less fade away. 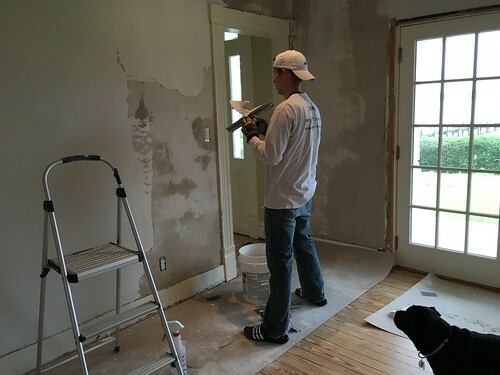 One of the real keys to this process is working up the "cream" of the plaster. This rather wet and smooth byproduct of working the plaster is great for filling in the little gaps and voids that are left from the first pass. After working the partially cured plaster for a while, it slowly transforms into an almost perfectly smooth surface with a little bit of coarse tooth to it. This tooth is there to allow either for a slightly rough finish, or as something for the smooth finish coat to grab onto. Our whole room took about 38 gallons of base coat total to make up the 2nd coat of plaster. You can certainly tell where I started vs where I finished because the surface ended up looking so much better as I got the hang of working with MoP. I also ended up going back over that first wall I did back in January in order to resolve the problems I caused before. It was as easy as applying a single thin coat over that section of wall. 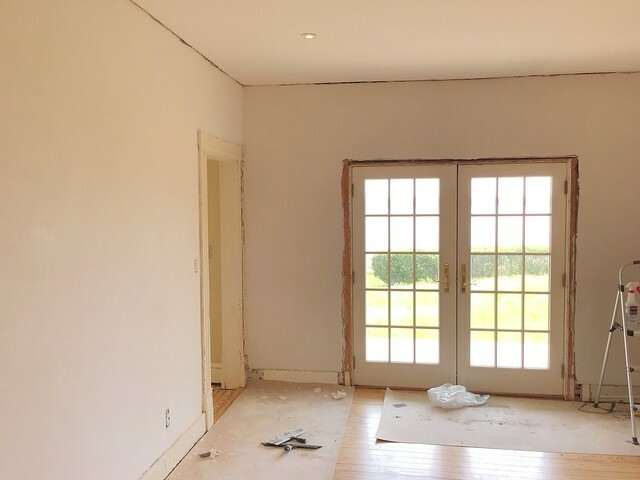 Now that we've got the 2nd coat applied throughout the room, I'm looking forward to working with the finish coat to give this room the beautiful and smooth set of plaster walls it's always deserved. I'm downright giddy about our progress, as it means we're a big step closer to being able to actually use our living room! 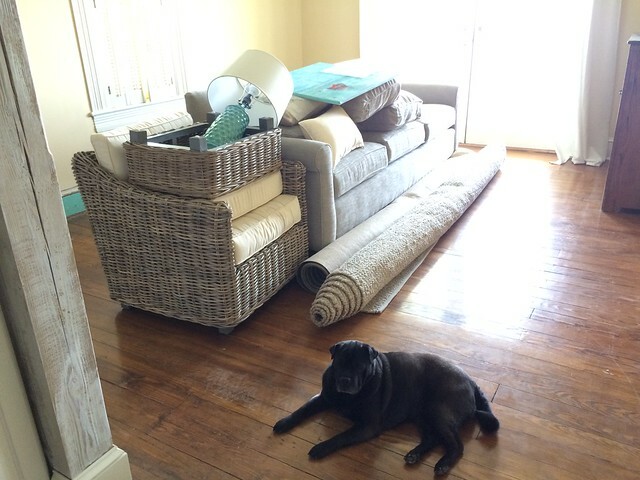 During this time, Wendy has started on the room design and we've been slowly purchasing new/collecting second hand furniture and accessories for the space. What will be the dining room has been serving as our temporary living room until the work is completed. It's a "temporary" (okay, so temporary means more than a year in our tortoise speed style of renovating) set up that has worked well to date, but it's going to be so great when we can spread out in the new living room...and not have to stare at a partially stripped fruit wallpaper border. What a huge step in progress--looking good. Even your temp living room is cute and cozy. Can't wait to see the actual one all done. Those before/after photos will be amazing! Meanwhile, any porch-party pics to share? Wow, that looks great! 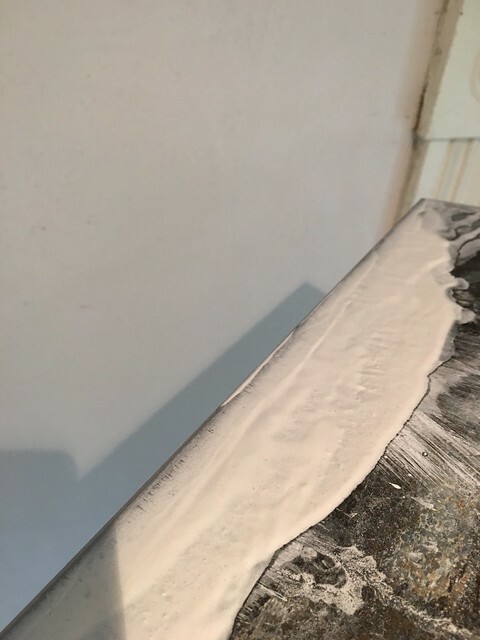 I've followed you method using joint compound working on my 1916 DC bungalow, and I can't say that I enjoy working with the joint compound (I eventually switched over to the easy sand version for the top couple coats, using the regular hard setting stuff for the base layers). What sort of coverage does the MoP end up giving you? 38 gallons seems like a lot for a second (nonfinish) coat, but it looks like that room is huge. At some point soon I plan on tackling my own living/dining room, and this seems like a far more forgiving material to work with. 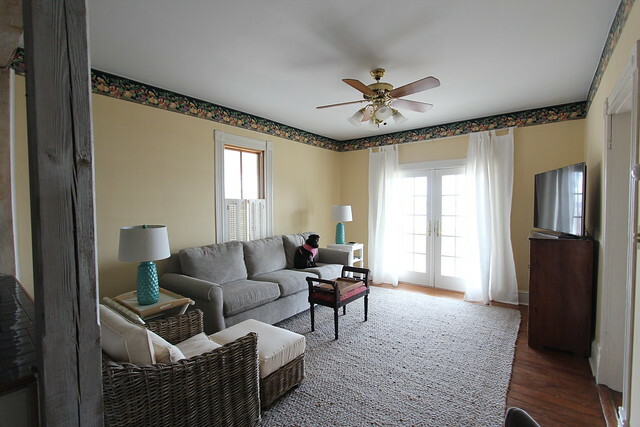 What are the dimensions of the walls you are covering? Sorry for the late reply. From our experience the coverage estimate on the container/literature for MoP is pretty spot on. Our room is quite large at about 32' long and 12' wide, so normal sized rooms will require a good amount of product, but not as much as we used. I do love that I don't sand this at all. Way less mess for sure, and way smoother than joint compound. Great work there, nice post! Great write up! 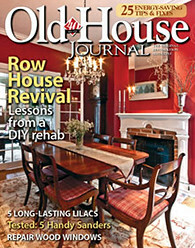 This is very helpful for me in deciding what I want to do to address my plaster issues in my 120 year Queen Anne. I've looked at the MOP product online and it sounds great but I'm a bit concerned about coverage and cost. 38 gallons for a base coat is a lot! And my area appears larger than what you did. If I remember correctly this stuff runs about $100 a gallon plus shipping. Is this another option instead of the joint compound? Or is this just a different situation? I found your website after googling how to fix cracks and huge pieces of plaster on walls. Thanks! Hi Whitley! 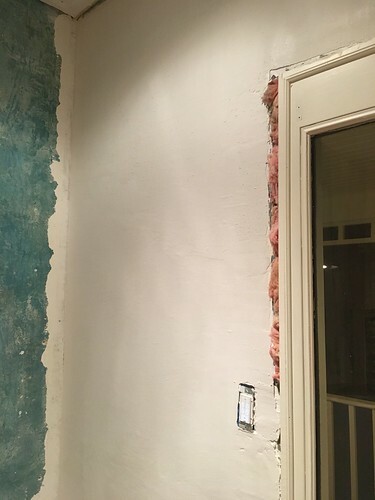 Yes, this is an alternate and more appropriate solution to correcting issues with plaster, as it uses the same materials that your plaster was likely made from to start with. Joint compound does work, but it can have problems down the road depending on what it's being applied over top of. Our walls looks great today and you'd never know he rough shape they were in before we repaired them. Best of luck.